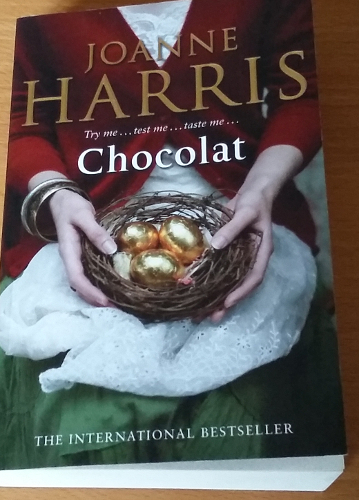 Fourth of the five books I chose for the “Read 5 books in January” challenge, “Chocolat” by Joanne Harris has been on my list of “books I should read at some point” for well over a decade. The main reason it’s languished there so long is that I watched the film first – and knew from the DVD commentaries that the story had been changed in its adaptation for film. So why the sudden decision to read the book after so many years of umm-ing and ahh-ing? Quite simply, I started paying attention to the author, Joanne Harris. Because of course, when one hears that there have been “significant changes” made to adapt a book into a film which one enjoys, it does make one wonder about the book, no matter what reputation the author has for quality because it’s not just about quality, it’s also about content. Anyway, I heard an interview with Ms Harris, and was so bowled over by her wit that I followed her on Twitter as soon as I got back to a place with an internet connection. “Chocolat” didn’t disappoint. In fact, I found the book to be far more powerful than the film. I can see why they made the changes they did to create the film, but in doing so they created a subtly different type of story. So, for anyone who doesn’t know: “Chocolat” is the story of a woman, Vianne Rocher, and her daughter Anouk, who open a chocolaterie in a small rural French town during Lent. The film is set in the late 1950s, so it surprised me to realise that the book is set far closer to modern day, being a contemporary when first released in the 1990s. Both versions have a fairytale quality to them, but the book has a far darker heart than the film. I also found the resolutions to the various plotlines differed from those I remembered in the film, and those in the book were far more satisfactory. I particularly liked the difference in the character of Armande Voizin: the book shows very clearly and distinctly the subtleties of Armande’s life, and the agency she exercises in her birthday celebrations. I also liked how Vianne was shown to be less than perfect: when she realises she’d never thought to ask Roux’s surname, yet Armande had. I felt there was an element of ‘passing the baton’ and gentle teaching in the relationship between Armande and Vianne, which added further depth to the story.